In China, the layout of the table is very different than in France because the utensils used are not the same. First, according to custom, round tables are the most practical and the most popular because everyone is at equal distance from the middle of the table where are put all the dishes. Then, the differences keep going with the flatware which is far away from our usual cutlery. 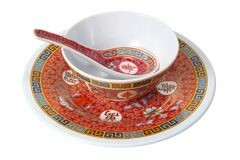 In fact we can find in a Chinese table the famous Chinese chopsticks, a small plate, a bowl and a spoon. 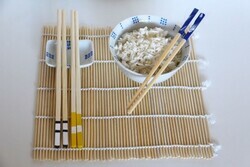 The chopsticks are made of bamboo or reusable plastic and they have their rules. First we must never planted his chopsticks in a dish because it reminds the ink sticks used for funeral rites, then break a pair of chopsticks in the house of a host can be understood as a death threat, rub a pair of chopsticks before starting a meal is a sign of politeness meaning the pleasant prospect of a meal with friends and finally cross a pair of chopsticks on the plate is a sign of death, chopsticks should be laid in parallel. All these beliefs around the chopsticks are very interesting because they show that the Chinese are always sensitive and attentive to their customs and that they perpetuate some traditional beliefs. Another difference is that generally there not glasses on the table because the Chinese are not used to drink while they are eating. It also happens that the traditional paper napkins are replaced by scented hot towels. In China, the guests are placed according to their "honour", defined either by age or by social status. The place of honour is located in front of the entrance door of the dining room and if possible, facing south. The place near the entrance door or located facing north are the less important and generally reserved for host (master house). Tradition wants that women are being separated from men by each occupying a different side of the table. Finally with a square or rectangular table, if there are only two persons, they must be on two consecutive sides of the table. The service and the course of the meal in China is different than France because we do not eat in the same way. Indeed, the Chinese do not eat individually in their plate as in the West, all the dishes are brought ​​on the middle of the table and everyone help one self directly into a small plate what he wants. Thus, everyone can create the blend of flavours that he wants. Normally there should be at the middle of the table as many dishes as there are guests. I think this way of eating creates a friendlier atmosphere during the meal because the host does not have to get up constantly to serve everyone. The rhythm of the meal in China is given by the guest of honour. No one should eat before he starts eating. It is better that everyone takes small portions at a time and the host must ensure a good filling of the plates of its neighbours. Finally at the end of the meal it is not polite in China to finish his dish to show his host that we have eat enough and that we have enjoyed the cooking. In China aspects of behaviour completely derived from those in western. This is the cultural difference that I noticed the most since I arrived in China and this is the one with which I have the most trouble. Indeed, it is common to see Chinese people eating with their fingers, eating their noodles with a lot of noise their head into their plate, spitting cartilage on the table or even burping at the end of their meal. In France, if someone would do such things, he would be considered very rude and nasty. In China it is definitely not dirty and that's normal. This cultural difference is so big that it can dampen a lot of people who do not have an open-minded. The Chinese are often categorized as “dirty in table” by the Westerns because they are doing the opposite of what has been educated us in France. At the end of the meal in a restaurant in China, there is no discussion of dividing the bill because it is considered like socially unacceptable. Share the bill for the Chinese is considered as a sign of avarice. I think this comes from the way the food is eaten. In China everybody share the dishes, whereas in France everybody chosen individually its dish for which he pay. In China the true honour is to pay for its friends, so the fight is big and it is often common to see a scene of dispute to know which one of the guests is going to pay. Even if you are not the richest, it is customary to offer to pay the bill. This tradition in China has a lot to do with the concept of “face”, that means that the Chinese like to be socially recognized and valued as a person. I love this cultural aspect of Chinese, because I think it shows their huge generosity. In China It is also customary that the guests reorganize other diners for pay the bill in their turn.